To be honest, the event system is already around for some time, but only recently I got the chance to really dive into it. The problem in our project was that there were multiple systems that used input to perform their actions, but not every system was active all of the time. Or one was active but only if the input wasn’t consumed by a higher priority system. Although the systems were independent in general, because they have to share their input made them intermingled a bit too much in my opinion. So instead of using the input directly I tried to fully utilize the new event system to separate the systems again. One system should only get input events that are meant for it, so it doesn’t have to check if they are really valid. On the other side a system could deactivate itself easily by deactivating its event handlers. First of all the input events have to be generated somehow. This is done by the input modules. The standalone input module is used for standard mouse input that you will most often use on Windows, Mac or Linux standalone versions of your game. The touch input module is meant for mobile devices in first place. It generates input events from the touch input of the user. The second step is to decide where the event should go. The party responsible for this is the EventSystem script. There should be only one in each scene and it is informed about the event that are generated by the input modules. To do its job, the event system utilizes the raycasters in the scene. The only job of those is to shoot rays through the scene that have their origins at the pointer/finger position of an event e.g. a tap. They deliver a list of hit objects that are sorted by the distance on the ray, so the first hit objects are first in list. Those hit results are used to decide which objects the events are sent to. The first hit object that wants to consume the event gets it. 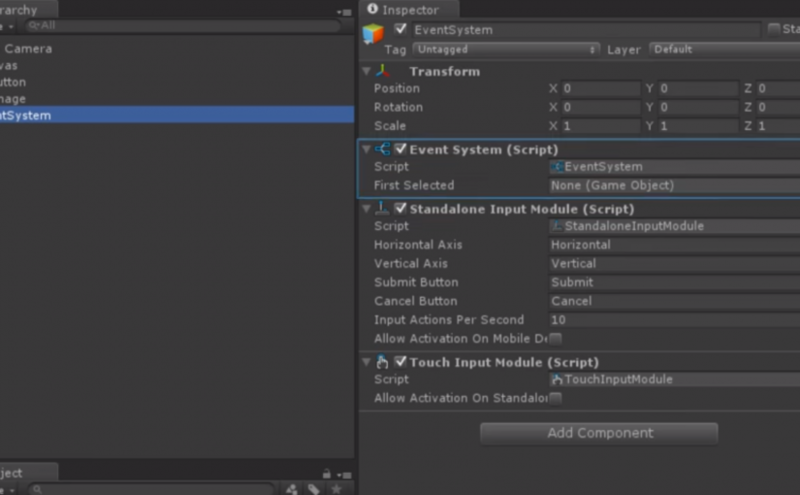 The most common use case for the event system is to use it for the UI when using the new Unity UI. This works out of the box, an event system is even created if not existent if a canvas is added to the scene. With the physics raycaster and the physics 2D raycaster you can use it for in-game interactions just the same, easy way. Using the same event system for UI and in-game input has the advantage that it solves ordering issues. In the past you may have checked your in-game input for “IsOnUI” before handling it. This isn’t necessary anymore as the input events are intercepted by the UI if it lies above an in-game object. The in-game object only gets the input if it was really hit. If we want to disable interactions with some in-game objects, we now only have to disable their input handlers. Another possibility would be to disable their collider, so the physics raycaster doesn’t find them anymore. There is even a Unity default layer called IgnoreRaycasts (ID: 2). Disabling the interaction like this allows a pretty good cooperation with other features as the input events are correctly forwarded to other interactable objects behind the disabled one. A practical example: When not in the edit mode for a building you can’t move it via drag. Moving the camera by dragging it should be possible nonetheless. By disabling the drag handler on the building, dragging the camera is even possible when above the building. If the handler would still be active and the dragging was disabled in a different way, the event would still be consumed by the building and the camera couldn’t be dragged above the building. In general this kind of deactivation makes the features pretty independent from each other as the event system decides about the delegation order and chooses different paths when handlers are disabled. I’m pretty content with the new system Unity provided to handle inputs and I’m glad they didn’t limit it to the UI. Using it for all the game makes sure that the order events are delegated is correct and doesn’t require to check if an event should be consumed (e.g. if the event is above the UI). In the end it makes features of the game that require user interactions much more independent from each other. The features can disable their interactions by simply disabling their event handlers and the input is correctly delegated to the next object by the event system. As Unity only covers the basic input events (enter/exit, down/up/click, beginDrag/drag/endDrag) I see a need to extend the event system a bit with custom events, e.g. for pinching or long presses. There seem to be some places to add custom logic like custom messages or the possibility to add own input modules. The whole event system is open source which should make it easier to find the right point to start. Hello, what about handling an input event but allowing it to propogate further? Yeah, those are tricky cases. Right now I already created a custom InputModule for our projects which works with gestures and a bit different to the Unity way. So I can’t tell you how it is done with the standard Unity InputModules. In previous projects I could solve those issues often by using a different input event (e.g. Press instead of Release) and/or rearranging the UI hierarchy. But it really depends on the specific use case. If you like I can send you the current version of our InputModule, but it’s still in development and not meant to be released yet. Where did you find out information how to extend input modules? Unity docs are scarce. Unfortunately, that’s true 🙁 I got most of the information by the UI source code which they share in a bitbucket repository (https://bitbucket.org/Unity-Technologies/ui/src).